Invisalign - The Modern Way to Realign Your Smile - Brian Klym DDS | You'll Smile More! Your smile is a major part of your identity and how you feel about it has a significant impact on your self-esteem. People with misaligned teeth have a tendency to become self-conscious about their smile and hide it from others. That’s why our dentist in Traverse City proudly offers Invisalign, a convenient way to straighten your teeth without the hassles of traditional metal braces. 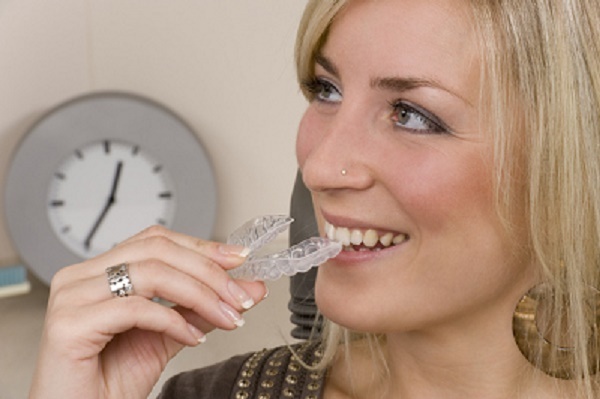 With invisalign, you use a series of clear plastic trays to gradually straighten your smile. Invisalign is a metal-free way to realign your smile. What’s more, the treatment time with Invisalign is much faster than traditional braces. Invisalign is a great option for teens and adults looking for an exciting way to straighten their smile. For years, metal braces were the only option for patients looking to realign their smile. It’s true that metal braces are effective, but they have a lot of drawbacks. Metal braces can irritate the soft tissue in your mouth and they have sharp wires that can scratch the inside of your cheeks. This is especially true for young people and others who engage in high contact activities such as sports. Metal braces also require regular office visits for tightening. This can be painful and time-consuming. Additionally, metal braces limit the type of foods you can eat. Regular dental hygiene becomes more difficult when you wear metal braces and you need to avoid food that can get stuck in your braces. Otherwise, it can damage your dental hygiene and lead to cavities. Another problem with braces is that they’re distracting and unpleasant to look at. This can be a real issue for teens and others who are self-conscious about the way they look. With invisalign, you straighten your teeth using clear plastic trays that look a lot like dental mouthguards. Following your dentist’s instructions, you switch out your invisalign trays over time as you gradually achieve a healthy and well-aligned smile. Invisalign requires far fewer dental appointments than regular metal braces. Another great thing about Invisalign is that you can eat what you want. You simply remove your Invisalign trays when you’re ready to eat and replace them when you’re finished. You can also take them out for brushing and flossing, so Invisalign trays don’t interfere with your normal dental hygiene. The course of treatment is also much faster with Invisalign. Regular braces typically take two years or longer to straighten your teeth, but with invisalign you can usually complete your treatment in a year to a year and a half. Dr. Klym offers a variety of treatments to help you achieve the smile of your dreams. Call today and find out what our Invisalign, dental veneers, dental implants, and other treatments can do for your smile.